Do I need a drinking fountain? As an Architect, I interact with clients, engineers and contractors who have acquired bits of information about Building Codes. Sometimes, those bits are misconceptions and regurgitated information. The building codes can be intimidating and have no beginning or end. To learn the code, the best way is jumping in feet first. Do you ever wonder when you need an automatic drinking fountain in your office, your store, your warehouse? The building codes IBC (International Building Code) and IPC (International Plumbing Code) both discuss when a drinking fountain is required. Local jurisdiction may have overriding amendments. The information below states the requirements as interpreted from the current 2018 IBC/IPC. Drinking Fountain is not required in small occupancies per 2018 IBC/IPC for occupant loads less than 15. Per City of Phoenix Code Amendments, Drinking Fountains are not required for occupant loads less than 50. Where drinking fountains are required, not fewer than two drinking fountains shall be provided. One fountain to comply with wheelchair (36″ max. spout a.f.f.) and one for standing (~40″). Water dispensers shall be permitted to be substituted for not more than 50% of the required number of drinking fountains. (Interpretation – Drinking fountain with a bottle filler option, would satisfy the requirement for two drinking fountains). Drinking fountains shall not be required in tenant spaces provided that public drinking fountains are located within 500 feet and not more than one story above/below tenant space. In covered or open malls, drinking fountains shall not be required in tenant spaces provided that they are located within 300 feet. 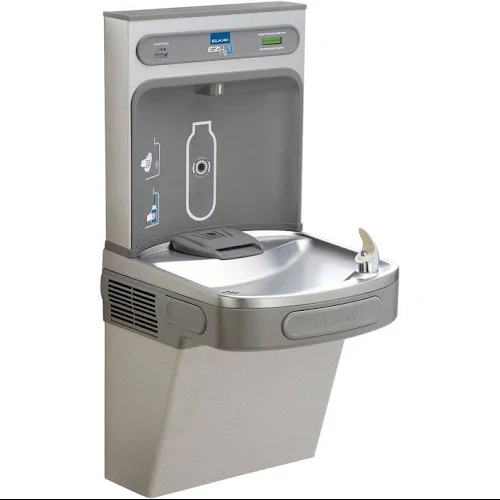 As water bottles have become more popular, bottle filling drinking fountain stations have become more prominent. In 2010, Elkay introduced a new drinking fountain. It was in response to consumer demand and environmental concerns of disposable bottles. The product notifies the number of water bottles saved. Product notifies user to change filter as needed. This ensures and reinforces to the user that the water is safe to drink. At least one drinking fountains installed must meet ADA requirements. Spout height at 36″ above finish floor maximum. The 2010 ADA standards does indicate, Section 211.2 Minimum Number – No fewer than two drinking fountains shall be provided. One drinking fountain shall comply with 602.1 through 602.6 and one drinking fountain shall comply with 602.7. Exception: Where a single drinking fountain complies with 602.1 through 602.7, it shall be permitted to be substituted for two separate drinking fountains. So what does 602.7 change to make it possible for one drinking fountain. Essentially the Spout has to be between 38″ minimum and 43″ maximum above the finish floor. This is higher than what is depicted in section 602.4 Spout height, which indicates 36″ a.f.f. Do I need a drinking fountain? Drinking fountains are essentially required unless you have minimum occupants. Less than 15 occupants per IPC code and in some jurisdictions, such as Phoenix, less than 50 occupants. 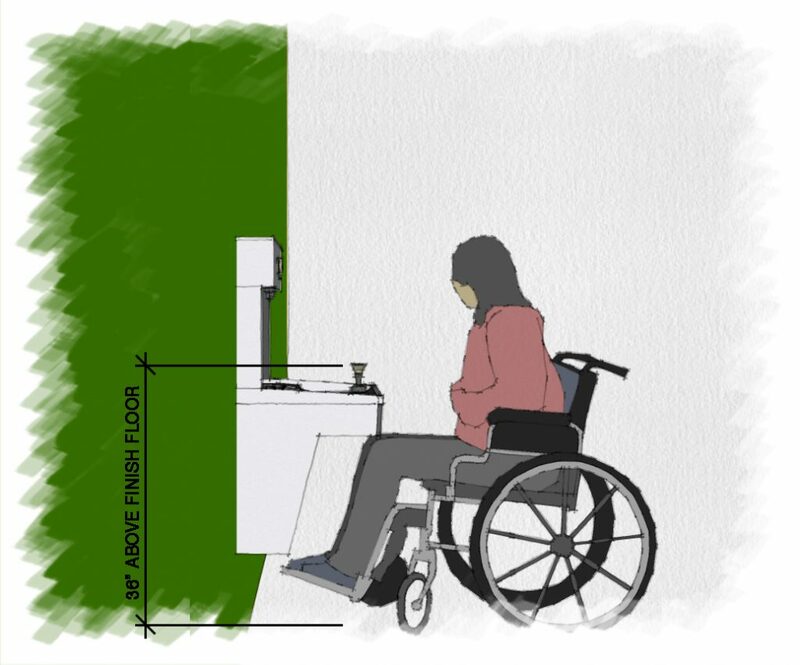 Where a drinking fountain is required, fixtures need to meet ADA requirements.